- Freddie Barrass out in bizarre hit wicket dismissal. 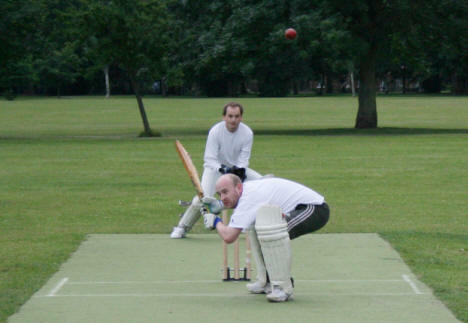 Playing a full forward stroke, his bat slipped from his gloves, flew high above his head, and, as he set off for his run, fell down and crashed on to the stumps. - Barrasses father and son took wickets, Freddie smashing down the stumps with punishing deliveries, Philip clipping off stump in an otherwise wayward over.